As the owner of a Samsung Galaxy Tab S2 NOOK, you’re the master of your digital domain. However, there are times when you may want to (or be persuaded to) share your amazing little tablet with others: spouse, friends, or even children. The content of your library of items purchased from the NOOK Store. Any personal material you’ve downloaded, uploaded, or created on the NOOK tablet. The right to go to the NOOK Store and buy any kind of material, without regard to appropriateness, price, or value, using your preloaded credit card. Primary Profile. This profile is created when first you register your NOOK. The owner of that profile, protected by a password, can make any sort of digital purchase and view any sort of content on the tablet. All purchases made on the NOOK are processed using the credit card information on file. The keeper of the primary profile can create and edit profiles for other users and manage their access to content. Adult Profile. You can create a profile for an authorized adult, allowing that person to purchase any type of content and to decide which of those items are visible only in this profile and which can also be viewed by a child. This secondary adult profile, though, can’t control which content is visible to the primary profile holder. Child Profile. The standard settings for a child profile allow the child to only view or buy content authorized by the primary profile. The owner of a child profile can’t create or edit other profiles, and can’t override any parental controls. Sign in as the holder of the primary profile. From any Home screen, tap the Apps icon, and then the NOOK Settings gear. Tap the + symbol at the upper-right corner. Follow the onscreen prompts to decide whether you want existing NOOK Store content available to the holder of the new profile. Profiles can be used to manage access to content by youngsters or by adult users other than the owner of the device. From any Home screen, tap the Apps icon, and then tap the NOOK Settings icon. Tap the + symbol at the upper right. Type in a name for the new profile. Tap the checkbox next to Child Profile, enter the child’s age, and accept the terms and conditions. Follow the onscreen prompts to select the permissions you want to give the child. Purchase from the NOOK Store only when they’re given and properly use your NOOK account password. Shop only for kids’ content. Access Reads for Kids, Videos for Kids, Apps for Kids, or Games for Kids. You can also select which TV and movie ratings are offered to the child: G, PG, PG-13, TV Y, TV Y7, TV G, or TV 14. You can share all or some or none of the content in your library with each profile. Depending on the item, the user of the other profile may have immediate access to a book or other publication or may need to download it. An active Wi-Fi system with Internet access is required for any download. Annotations to a publication, such as notes and highlights, are specific to the profile that added them. As the primary profile, if you make notes, they aren’t visible to other profiles. Similarly, if someone using a different profile makes notes or highlights, they’re not visible to other profiles. And it gets even niftier: If two or more profiles have access to the same book, their reading positions in the book are tracked independently of each other. So you can stop reading on page 38 and return to that spot, while another profile holder can be at page 237. The manager of the primary profile can assign content to the various adult or child profiles. And the holder of an adult profile can limits material for child profiles. From the NOOK library, tap and hold on the cover of an item. Tap a checkbox next to a choice to allow profile holders access to them. From within the NOOK Store, NOOK Library, or NOOK Home, tap the NOOK Navigation Menu. 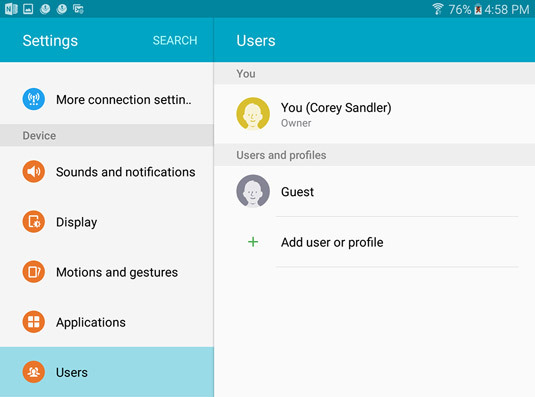 A list of additional profiles created for the device appears. Tap the profile name to which you want to switch. As the holder of the primary profile, you can delete an adult or child profile. Tap beside the profile you want to delete and then tap the Trash icon beside the name. Tap Delete to confirm your instruction.